Relax, play and enjoy a vacation or getaway in our immaculate, luxury villa in Palmetto Dunes Resort, rated one of the Top Ten Family Resorts in the USA by Travel and Leisure Magazine! Our two-bedroom, one bath Queens Grant villa is a perfect setting for family vacations, honeymooners, a girls-only weekend or a golf foursome eager to play the challenging courses in Palmetto Dunes, Sea Pines or other venues on- and off-island. At our villa in Queens Grant, you are only a short walk to three miles of pristine beach and steps away from one of the five sparkling pools in the complex. Three challenging golf courses, an award winning tennis and Pickleball complex, miles of walking and jogging trails, and 11 miles of canals and waterways offer endless opportunities for recreation, exercise or just a leisurely stroll to enjoy the lush landscape and abundant wildlife. Location, Location, Location: The Palmetto Dunes Buggy offers free 'on demand' shuttle service to the beach and other destinations in Palmetto Dunes and Shelter Cove. They provide door-to-door service with plenty of room for all your beach chairs, coolers, boogie boards and such. The villa is equipped with four beach chairs, beach towels, buckets and shovels for hours of beach entertainment for the kids. The bookshelf is stocked full with books just right for beach reading. And for that rare rainy day, there are board games, card games and a variety of movies to keep everyone's mind off the weather. With Palmetto Dunes Resort located mid-island, our villa is the perfect place to enjoy all the island has to offer. There is easy access to Shelter Cove Marina, just across William Hilton Parkway using the convenient and safe newly renovated underpass. Walk to the marina and enjoy the Tuesday evening fireworks (summer only), entertainment for the family, and the many restaurants and shops. Shop the new Shelter Cove Towne Center with lots of new shops, restaurants, Kroger and Whole Foods. Feeling adventurous? Rent a canoe or kayak and explore the 11 miles of waterways that wind through Palmetto Dunes, with the best views of the golf courses, landscapes birds and waterfowl. Fishing is catch and release, but you are welcome to take home the stories. Your Resort Villa: Need a cool drink, Starbucks coffee or a quick snack? Forgot your suntan lotion or need to stock the pantry with a few items? The General Store has everything you need, fast and easy. The kids will love their candy aisle, frosties and soft serve ice cream. From the best breakfast sandwiches to fishing bait, they have it all. Relax after a day of sun and adventure at our fully renovated, two bedroom, one bath villa with travertine tile floors throughout. Have a glass of wine on the spacious deck while you enjoy a resort setting on the pond. Feed the ducks, marvel at the grace of the blue herons and white egrets or the curious turtles sunning themselves on the banks. Have your morning coffee or a family breakfast at the round table under the patio umbrella, and wow them with your skill on the gas grill for a quick lunch or dinner. You can watch your favorite shows or movies on the 47' flat screen HD TV and Blue Ray DVD player in the great room. Watch your favorite show while the kids or other guests watch their favorites on the flat screen TVs in the bedrooms. Relax, Dream, Enjoy: You'll feel like a master chef in the all-new kitchen with granite countertops, a fulll-size new washer and dryer comb, over-the-counter microwave and flat surface GE stovetop and range make time in the kitchen a pleasure. There is plenty of storage for your favorite foods and snacks in the large pantry and French door LG refrigerator with icemaker in the deep, pull-out bottom freezer. A tall-tub dishwasher and garbage disposal complete the amenities. At day’s end, dream about your day on the links or beach in the luxurious King size bed in the master bedroom. Catch up on the news or watch a late movie on the 32' LCD HD flat screen TV. Wake up refreshed and linger awhile to enjoy the pond view outside the bedroom patio doors. Guests can relax in cozy twin beds in the second bedroom with its own 27 LCD HD flat screen TV. Each bedroom has spacious closets, a luggage rack, linens and towels. Need to check out Facebook or the email? Set up your laptop or IPad on the desk in the great room. Our high-speed wifi will keep you connected to home or friends while you're relaxing in the villa. Enjoy the luxurious spa bathroom with granite top vanity, tub and shower. All this, in beautiful, award-winning Palmetto Dunes, the best location for your Hilton Head vacation. Make some memories. Our guests return year after year. Book early for your vacation. Get ready for the day surrounded in luxury in the travertine tile and mosaic glass appointed tub/shower surround with adjustable rain-shower head. The free-standing cherry vanity with granite top and complimentary framed mirror complete the setting to get your day off to a good start. After a full day of fun at the beach, links or shopping the island, relax with a long, hot bath or shower. Bathrom complete with hair dryer and built-in night light. Deck with pond view, patio table, chairs and gas grill. Outside retractable clothes line. We truly enjoyed our stay. The villa was clean and well-stocked with everything working as expected. Was especially convenient with the washer & dryer in the unit. The patio deck overlooking the pond was a very relaxing place to spend both morning breakfast time as well as late afternoon cocktail hour. Especially enjoyed seeing the turtles and other wildlife around the water. Location was close enough to everything, yet away from the hustle & bustle of a busy island community. Great value for a 1+ week stay on HHI. Would definitely stay there again. Highly recommend! This was a great find for our stay on Hilton Head Island. The villa is clean and nicely decorated, the king bed was comfortable, and the location was convenient for getting around. We even saw the local alligator sunning himself by the nearby pond a couple times! What a wonderful Villa to stay in. My family of five stayed for nine nights. The villa was clean and comfortable. The kitchen was well stocked amd had very nice appliances. We loved the tile floors—perfect for the beach. The view of the pond in the back was nice and we enjoyed several meals on the large deck. The location was excellent. We used the Dunes Buggy each day to go to the beach—what a great amenity! The owner is very responsive and helpful. Overall, we had a great stay and highly recommend this Villa! My wife and I recently stayed at Oak and Palm with our two sons and had a wonderful experience. 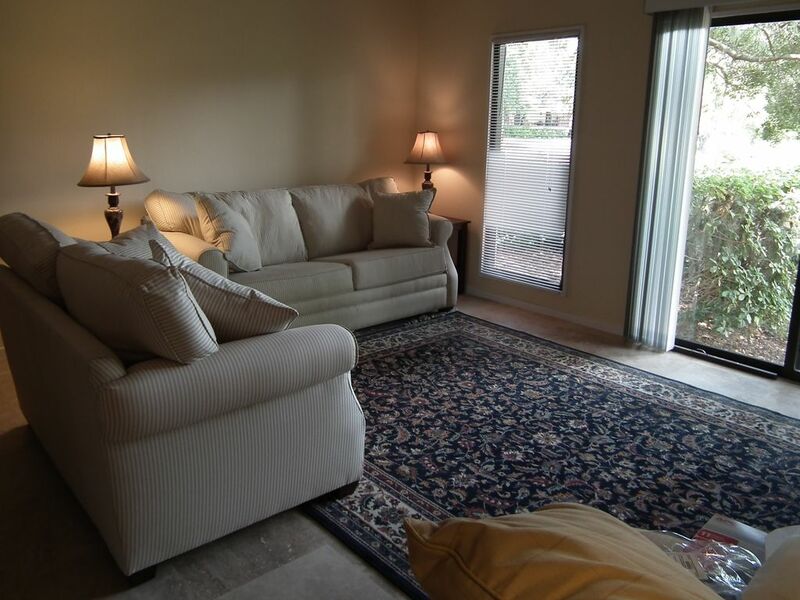 The condo is immaculate and in the perfect location overlooking the lagoon. It had everything we needed to feel right at home including cooking essentials, movies, beach chairs, beach umbrella, grill, and beach towels. It was the perfect place to come home to after a long day at the beach!! The owner, Mary, could not have been more accommodating and helpful, before, during, and after our stay. We highly recommend this unit. Thank you for helping us to build a lifetime of incredible memories with our family, Mary! Clean, great quiet location, villa had everything we needed and more! First time in Hilton Head for us and this villa was perfect for our needs! Everything from super nice beach chairs to fluffy brand new towels were provided with rental. The master bedroom is so spacious, the king bed was so cozy, and with a tv in every room kids were on best behavior :) Kitchen was so clean and well equipped, nothing felt “sticky” or worn out. All appliances and bathroom were top notch, no musty smells. Pools were clean and quiet, beach was amazing, we will definitely be returning!! So glad you enjoyed your stay. Would love to have you and the family back again next year! Thanks for the great review! You and your family were our very first guests at The Oak and Palm, and we've been thrilled that you've returned again and again for your family vacations. So glad you had another great stay. Hope to see you again next year. A short walk to the beach, golf, tennis, general store, restaurants and Shelter Cove Marina. Perfect mid-island location has everything you need for the perfect beach vacation. Stake out your favorite spot on the three miles of private beach or lounge at one of Queen's Grant's five swimming pools. No high rises, elevators or luggage carts required. Park outside the one-story, newly renovated villa with travertine tile and granite throughout. Rent bikes, canoes, kayaks and fishing gear to use on the miles of island bike trails and 11 miles of Palmetto Dunes waterways. Walk to Shelter Cove events via the 278 underpass -- no dodging traffic or parking hassles.